New kid on the block and recent Kickstarter success SIA Scotch Whiskey is creator Carin Luna-Ostaseksi’s attempt to create a blend (50% Speyside, 40% Highland, 10% Islay) to appeal to a “modern palate,” or as I take it, people who think they don’t like Scotch because it smells like their grandfather. It is an interesting market to target, one that’s already being aggressively lured away from flavored vodkas with flavored whiskeys–think Fireball, and those flavored Jim Beam and Bushmills things. A lot of writers whose opinions I take as gospel are on opposite sides of the fence, ranging from “who cares, it’s not even whiskey” to “this will ruin us all,” (outlined really well here by Drew Lazor for Punch) but the general consensus among whiskey drinkers is that the stuff is gross if you have to put it in your mouth. Personally, I’m ambivalent. I cringe a little when I hear people say “yeah, I love whiskey! Fireball is my favorite,” but for every one guy content with his Fireball, there’s one less buying an increasingly-tough-to-find bottle of something I love, bringing it home, and drowning it in Coke. 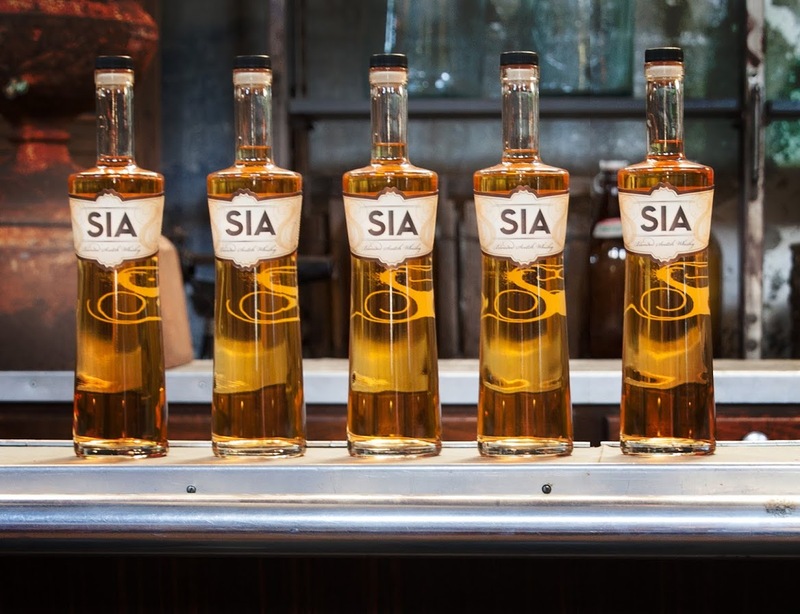 SIA seems to be taking a much more reasonable approach by blending a Scotch specifically tailored to these novice palates without adding other flavors to mask the natural flavor of the drink. Starting with the packaging, SIA has more in common with perennial liqueur favorites like St. Germain and Domaine de Canton than most Scotches I’ve seen, and even the name is a far cry from the Bruichladdichs and Laphroaigs of the world that the Scotch-shy might have a lifelong (albeit unfounded) aversion to. So far, I see what SIA is going for, and they seem to be doing an admirable job. But all this is just surface; how does it actually taste? We were sent a little taster bottle to figure that out, and Sarah from Whiskey Club came over to try it with me. We didn’t get enough to do any cocktail experimenting, so we just did a straight tasting review. NOSE: Pleasant, surprising lack of astringent burn. That band-aid smell most new drinkers complain about was entirely absent. Light and fruity was the consensus, with a little woodiness. Sarah got raisins and apple, I smelled more stonefruit. TASTE: More wood and less fruit than the nose. I got a little pineapple. Overall, we agreed it was eminently drinkable, like the Scotch version of a session beer. Almost no burn at all, with a lot of interesting flavors all mixed together. Once swallowed, the flavor doesn’t linger particularly long, as you normally might expect from something this light in body. We both agreed it would make for a great warm-weather drink. VERDICT: Honestly, it was better than expected. We both agreed we’d drink it again (which is a rarity among blended Scotches for us), and we wouldn’t mind keeping a bottle around. We might not seek it out at a bar where a lot of other options are available, but really, SIA isn’t (in my opinion) for us. I like my bourbons north of 100 proof and so full bodied that you practically have to chew them, and Sarah is on an endless quest to find the most absurdly peated, smokey Scotch on earth. What SIA seems to do well is bridge that gap between people who like to say they drink whiskey and people who actually like whiskey. It’s bright, balanced, and pleasant, and a damn sight better attempt at catering to less experienced palates than I’ve seen among the flavored spirit offerings. So if you’re one of the many that don’t LOVE Scotch, but you’d like to learn how, SIA could be a great first step down that path, in my opinion.